Quit wishin’…it’s time to go fishin’! Grand Bahama Island has long been known as home of “the grey ghost”, from the marls of the tranquil East End thirty miles east of Freeport, to the sand flats of West End and Old Bahama Bay, a Guy Harvey Outpost Expedition property. The island gets it name from the Spanish “gran bajamar”, translated as “great shallows”, and that could not be better said of the many flats and shoals along its mangrove covered coastline. The North Shore of Grand Bahama Island is one the Bahamas top fisheries for big bonefish where fish generally average in the 5- 7 pound range, although double digit fish are taken frequently. 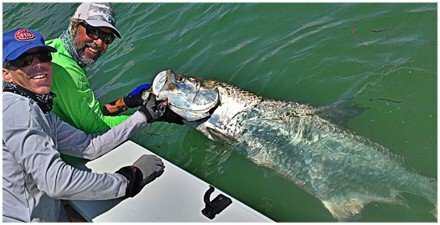 The north shore is also unique in that it is one of the few places in the Bahamas where tarpon are available (especially during the spring months). The action doesn’t stop with the flats, however! Sitting at the edge of the Gulfstream, Old Bahama Bay is the ideal spot to chase blue water game fish. Pick your species…blue marlin, white marlin, wahoo, tuna, mahi…all record sized fish, and all here to add memories of a lifetime! 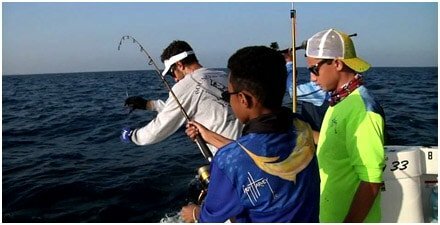 For the wintertime warrior when the winds blow through out of the North, the protected southern shoreline with its deep drop just yards offshore offers outstanding conditions for chasing big wahoos and yellowfin tuna within the lee. Whether you’re running north to Walker’s or south to the Hens and Chickens and Isaac Light, you’ll find the fish…they’re there waiting! Bring it on! Old Bahama Bay location is the perfect venue for fishing tournament due to its close proximity from South Florida and the fishing grounds right outside the marina entrance of the property. Tournament anglers have a quick access to the fishery with the steep drop-off of the Little Bahama a Bank just outside the cut at West End. This is known in particular to hold ravenous wahoo and other species. 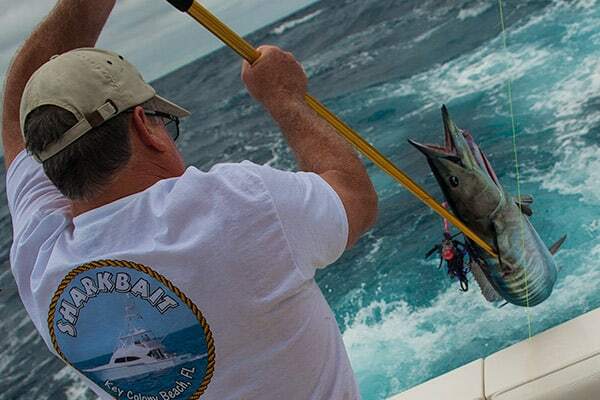 It is such a great venue from fishing and accommodations that Old Bahama Bay Resort & Yacht Harbour is also the venue for the annual Burning Wahoo Festival & Tournament. Find out more on the upcoming wahoo tournament by clicking here: www.bonfireseries.com. 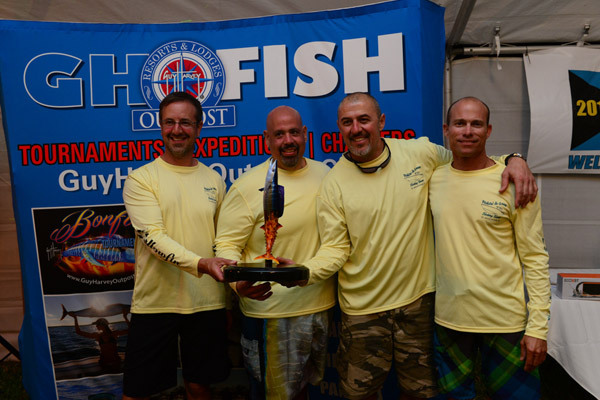 If you are interested in hosting your own tournament at West End, call Guy Harvey Outpost Fishing Team. We can help coordinate, organize or run your tournament in West End. Make it easy on yourself, so you can spend time fishing the tournament as well! Native Fishing AdventureFull day includes diving for conch and lobster and fishing. An unforgettable day out. Price: $400 per trip based on 2 persons; each additional person $150 with maximum 6 passengers. Catch can be taken to Teasers to have it prepared as a meal for an additional fee.Old Bahama Bay is also an Official IGFA Weigh Station. World record fish can now be weighed and recorded so it is time to GHO Fishing! At Guy Harvey Outpost, we take fishing regulations seriously. We’re committed to conservation and hope you, our guest, is as well. It’s important to know and respect the fishing regulations of the Bahamas. Sadly, for some anglers catch limits are disregarded, catch and size-limits for conch are ignored, the ‘closed season’ for lobster is considered irrelevant and spearfishing restrictions are for others. These practices quickly result in an unsustainable fishery. So we ask all our anglers to be good sportsmen and conservationists, and respect the regulations. As with fishing regulations back home, they change frequently, and seldom get less restrictive. Penalties can be extremely\ severe, so we encourage you to familiarize yourself with the current regulations posted below. Email any questions you have to : fisheries@bahamas.gov or contact the Outfitter for clarifications. Let’s all respect the regulations. Remember, we ask our Guy Harvey Outpost sportsmen to be a part of the solution, not the problem. Thanks! Guy Harvey Outpost does not assume any responsibility for the accuracy or enforcement of the Bag Limits noted below but we try to keep current on Bahamas Fishing Regulations. It’s very important to be familiar with the limits as they change often, and the penalties can be severe including confiscation of your vessel! Lobster or Crawfish No more than 10 tails at any given time. Annual closed season is April 1 to July 31. Minimum size limits are 3-3/8 inch carapace length or six inches tail length. Egg -bearing female crawfish are protected. Conch Limit at any given time is no more than 6 per vessel. Harvesting and possession of conch without a well formed lip is prohibited. Wahoo/Dolphin/Kingfish/Tuna Migratory species shall not exceed 18 fish per vessel at any time. Demersal Species (grouper, snappers, etc.) No more than 60 pounds or 20 scale fish. Stone Crabs The minimum harvestable claw is four inches. Harvesting of females is prohibited. The season is closed from June 1 to October 15. TurtlesIllegal to harvest by any means or have onboard at any time. In the Bahamas, you are not allowed to use scuba gear or an air compressor to harvest fish, conch, crawfish or other marine animals. A Hawaiian sling is the only approved spearfishing device in the Bahamas. There are numerous Lionfish Derbies hosted throughout the Bahamas to help eradicate these invasive predators. Spearfishing restrictions do apply to the taking of Lionfish other than when participating in events sanctioned by the Government where a waiver of the speafishing regulations is granted for research purposes. Spearfishing is not allowed within one mile south coast of Freeport, Grand Bahama.